Installing a new bathroom suite is one of the major investments a homeowner has to make at least once over the ownership of a property. The costs can vary, depending on whether you decide to do the work yourself or engage the services of a specialist bathroom fitter. The skill set you will need to possess is extensive, from electrics to plumbing, painting and decorating. This article will provide you with some guidance on how much it will cost to fit a new bathroom. Why it’s important to decide from the outset whether you are taking a DIY or Professional approach. What the major factors affecting overall bathroom installation costs are. The price difference between installing a standard bathroom suite over going all in and choosing a luxury bathroom suite. Some of the things you can do to keep costs lower e.g. not changing bathroom taps. The opportunity to receive a no obligation quote from expert bathroom installers with a proven track record and verifiable testimonials from satisfied customers. Please keep reading to find more information about the costs involved to create your ideal bathroom. DIY or Professional Bathroom Installation? As mentioned earlier, one of the first decisions you need to make when it comes to a bathroom upgrade is whether you will do the job yourself, or appoint an expert. Unless you are an accomplished plumber, tiler, electrician and painter all rolled into one, finding an expert is the most cost and time effective way to go. When it comes to costs and a DIY approach, you may be able to control the cost of the individual items such as sink, toilet, bath or shower. However, the quality of the installation may not be as perfect because of the lack of required expertise. A single price for the job covering all aspects of the installation including changing bath taps if needed. One point of contact for the job that will manage and coordinate all the trades to deliver the bathroom of your dreams. Once you have decided to go down the professional installation route, the next step is to have an understanding of how much each component of a bathroom installation costs. This will permit you to compare prices on a like for like basis. Below is a price guide on what you can expect to pay for the separate service aspects (electrical, plumbing, tiling etc.) as well as for the different parts of the bathroom suite. Generally, the cost for a bathroom replacement will range from about £2,750 to over £6,500 for the basic (lower end of the scale) to luxury bathroom (£7k plus). Below are UK average costs for a standard bathroom upgrade with minimal redesign work for each aspect of the bathroom installation job. Depending on how old your current bathroom is, you may be looking to upgrade the lighting to led spotlights, both for their nice look and lower running costs. Other electrical work may include installing a hand dryer, shaving socket, extractor fan and power shower. Typical costs can be around the £300 mark depending on other variables. Tiling is one of those trades which require expertise if to be executed flawlessly. Depending on the size of the bathroom and the type of tiles chosen, as well as whether you are supplying the tiles, costs may vary widely. An average cost for tiling is between £850-£950. This is one of the more difficult and costly mistakes to rectify post project so it’s important to ensure you get the best tiler you can afford. One of the most commonly ignored “extras” that comes to haunt most homeowners is flooring. Some bathroom fitters will omit flooring on their quotes to make sure their price is low and then add it on as an extra. You should always ensure you have the price included if you are looking to replace the flooring. For vinyl flooring, you can expect to pay in the region of £250 – £450 depending on the size of the bathroom. Undoubtedly, a bigger chunk of your money will go towards plumbing related activities including new taps, toilet, shower or bath and sink. The costs can mount if there is a significant alteration to the existing layout, requiring more plumbing work. About £700 to £900 will be required for the plumbing services. Most people prefer to select the bathroom suite of their choice and then find an installer. It is a significant purchase and when you have made such a commitment, it’s vital you find the right installer who will bring your dream to life. Bathroom suite prices will typically be around the £1000 mark for standard suites, with budget ones coming a bit lower and luxury suites significantly higher. Finally, another important aspect is the cost of gutting the existing bathroom and disposing of the waste appropriately. Depending on the type of fixtures you currently have, there may be scrap value to them. You may decide to remove and keep these items yourself and then the contractor will do the rest. Since tradesmen pay a disposal fee via their business rates they will charge a modest fee for disposing of the waste on your behalf. Average costs for gutting and waste disposal fall within the £300 to £500 mark. Hiring a skip is common then all the waste can be removed in one go. Hopefully you now have a general idea of how much you can expect to pay when it comes to bathroom installation costs. As discussed above, a variety of factors will affect the overall cost and regional price differences should not be ignored also. The phrase “London prices” is common and you can generally expect to pay less in different parts of the UK. 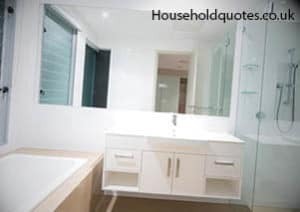 Get FREE Bathroom Quotes Today! Hi there, could you advise how much it would be to replace my showerroom. At the moment it is fully tiled walls and floor. I would like it fully replaced including wall boards and new floor tiles. My quotes have just come in at between £3000. & £5000. I’ve gone with the lowest one from a good plumber , I’m getting wet wall on two walls, a new toilet , sink & shower cubicle et. and shower . No flooring is included as I can get that very cheap myself. It includes stripping the tiles on the floor and tiles around the shower area and keeping suite as cheap as possible though good quality. Nothing is being moved except I’m getting an old radiator removed and replaced with a modern one. I’m guessing £1200 on labour and the rest supplies and paying wet wall guy. Good luck , I had hoped for less but didn’t realise it takes them a whole week to fit and how much everything adds up to even in a tiny en suite !! I’m a bathroom installer and I’m surprised to say that this is pretty accurate article. Our bathroom installs normally start at £2500.00. People don’t really understand why so I wrote this blog which explains the process ‘How long will it take for my new bathroom to be fitted?’. I’d appreciate it if you could read this and let me know your comments. In my experience if you want a job doing well, you pay for it. We had a quote of £4000 for our bathroom and were all set to go with it until we spoke to a mutual friend who used the same plumber. They apparently botched the job and seemed to disappear when they needed help. They spent £1800 on their bath, bog and sink etc and they were beautiful but the poor workmanship has made the bathroom look awful. Dodgy pipework, leaks and tiles falling off. Not good. I have had another quote for just over £6000 for installation and I am spending about £2600 on my bath etc. I am happy to pay that because the company I am using give a 5 year warranty on the work! Get Your FREE Bathroom Quotes Today!